A crisp early-Autumn morning, a blue sky, and this balloon was drifting past the house. At ground level the air was still, but the ballon was moving swiftly; it was lost to view in half a minute. It seems to be advertising the Loué brand of eggs. Loué chickens are free-range, raised on various affiliated farms in the general area, and the village of Loué itself is about half-an-hour's drive from here. Eggs come from chickens, vegetables grow in the ground, cereal comes from grain, and bacon comes from pigs. I remember quite distinctly being shocked as a kid when it finally dawned on me that you have to kill the cute little piggy to get the bacon. This undoubted cousin to the Three Littles who so bravely defied Mr BigBad the wolf, met his end to provide me with my breakfast. They don't take any prisoners in the Mayenne. 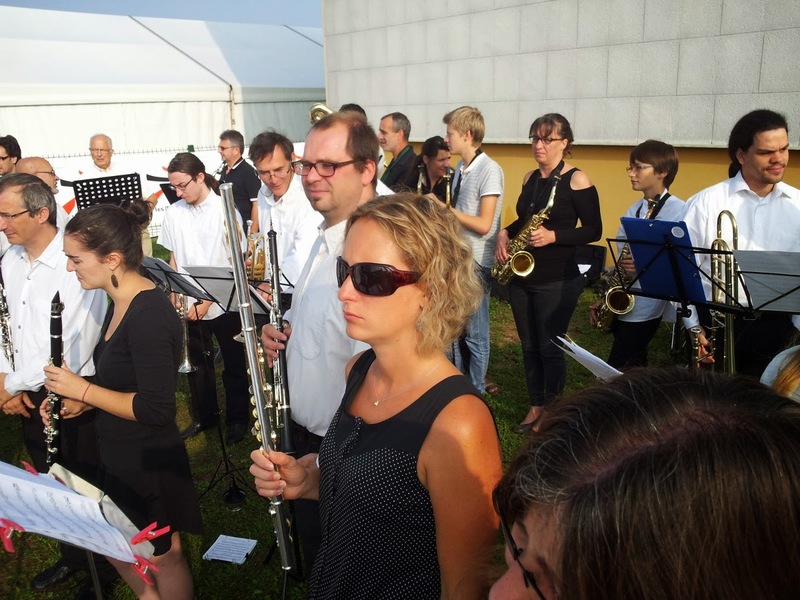 I played with the Evron Harmonie recently at the opening of the "Festival de la Viande", the meat festival. It's basically an agricultural show, like I used to visit with my parents on Southampton common. I went in to have a look at the show, and to get the free drink for having played. There were all sorts of things on display, more or less related to farming; tractors, fencing, dodgy-looking veterinary tools, plus wine, double glazing, and the inevitable bank or two. And of course, animals. 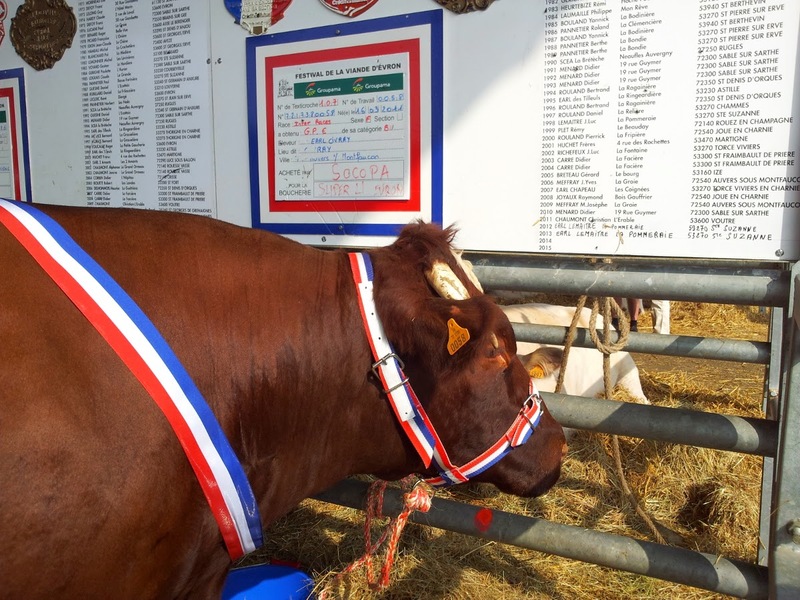 The cow in the picture below, having won the big prize, is announced as having been sold to SOCOPA (the local abattoire, and (possibly) the biggest single employer in Evron), to be made available in meal-sized bits via Super-U, a local supermarket. 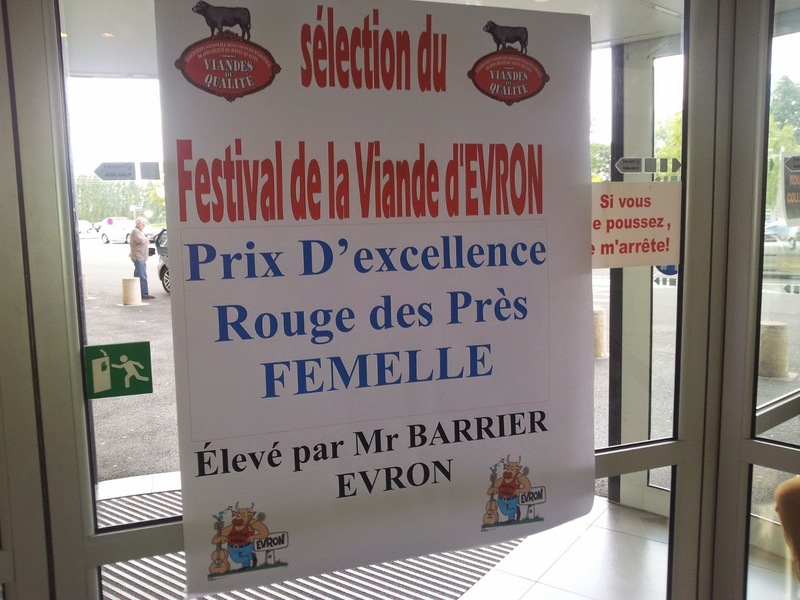 And this notice in the Super-U itself announces the availability, in affordable packages at the meat counter, of the female Rouge de Près breed, Ermintrude, another prizewinner, whose preferred meal was daisies and grass, who liked running around and preferred Bach to Mozart. 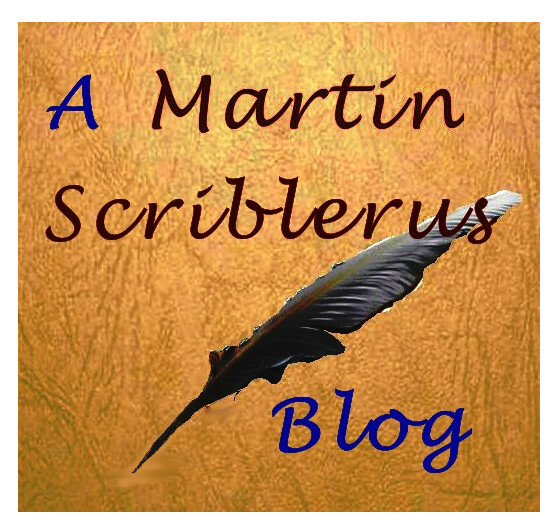 I must try to find out if mayenne children are as naïve these days as I was then. I kind of doubt it. 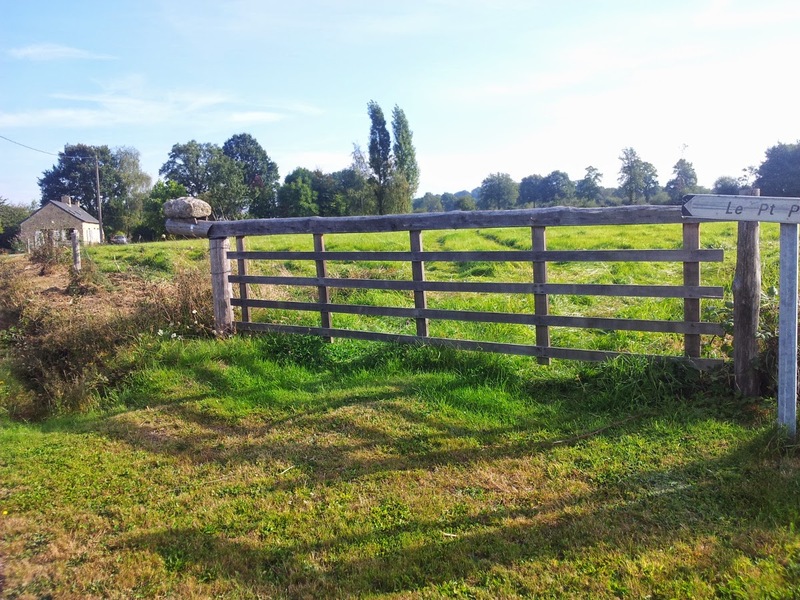 The fields around here, when they have a gate at all, have a big one. 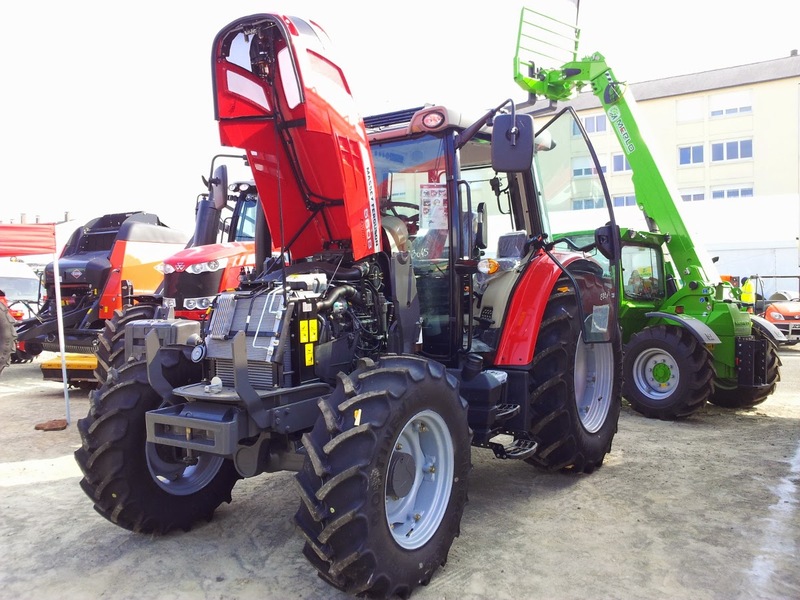 It's so that lots of cows can squeeze through at the same time, and big bits of agricultural machinery can pass through too, though not at the same time as the cows. They have to stand a bit of abuse too, so are built to be strong and long-lasting, which makes them heavy. I came across this gate on a random bike ride today. 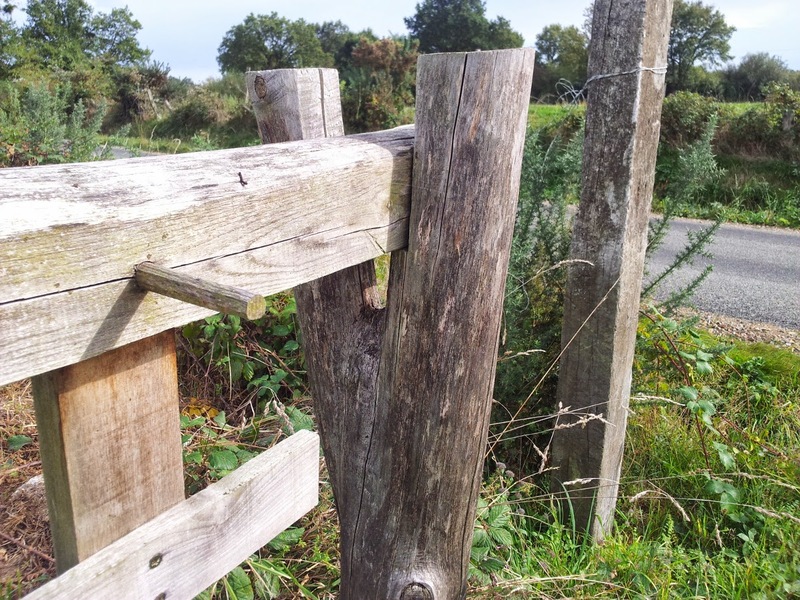 It doesn't have traditional hinges, but pivots on the left-hand post. The right-hand end of the gate rests on a cradle. To open, you lift it off the cradle and walk the end in a 1/4-circle. 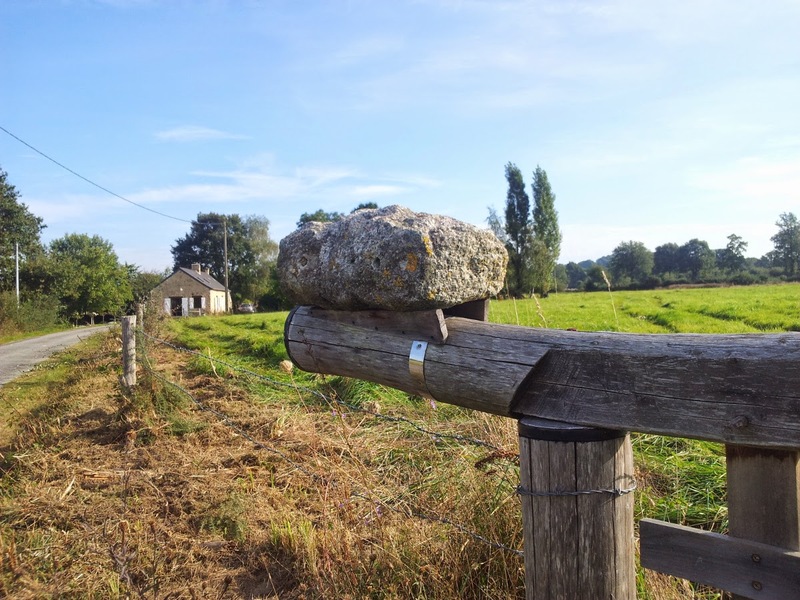 This is the first one I have seen with a dressed stone as a counterweight, and I particularly liked the holder that has been built for it, specially shaped. The holes in the stone testify to a previous life, and the gate looks well-crafted. 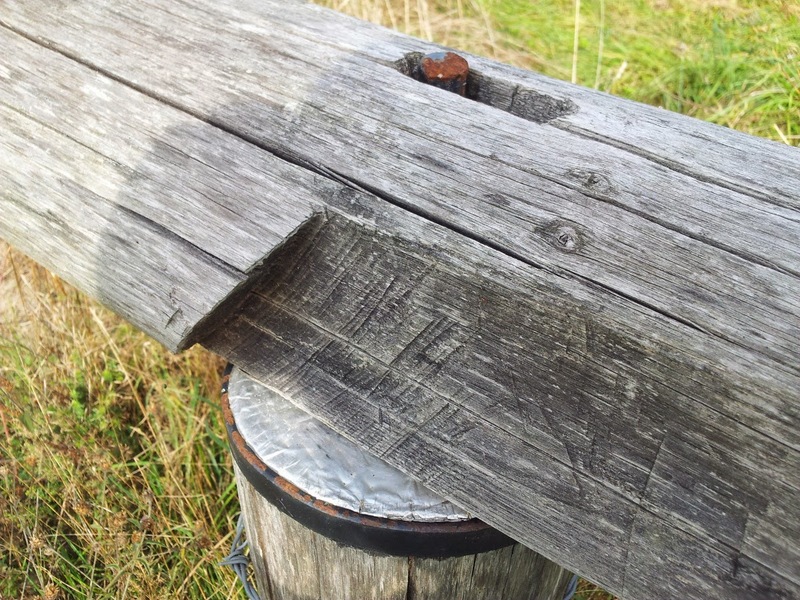 I find a robust beauty in this sort of craftsmanship. 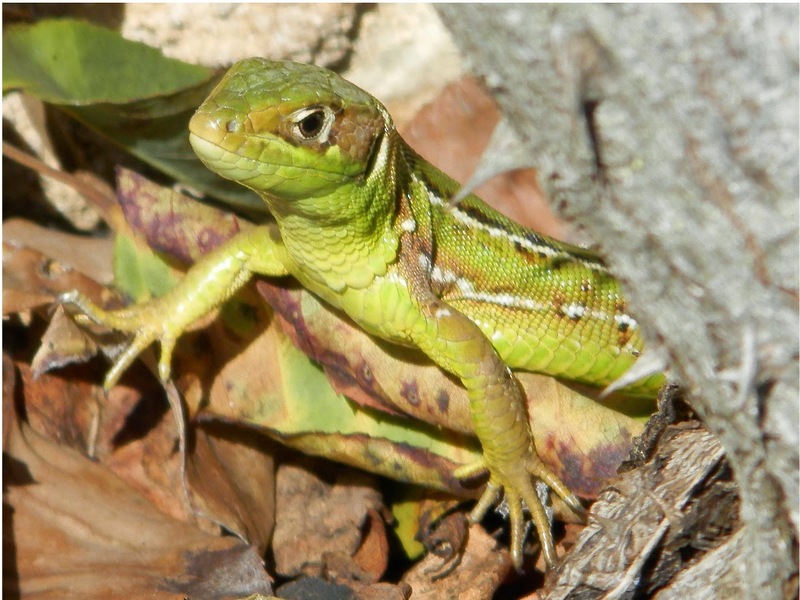 This green lizard came visiting today. I think it's a juvenile, on account of the white stripes down the side. It's la rentrée, the time when French families come back from their holidays, workers go back to work and the kids go back to school. It's the time for vide greniers, that is, car boot sales, and they're always good for a nosey browse. The cross-trainer is a recently-invented excercise machine, you can work quite hard with it, and it has the advantage that there is little or no physical shock transmitted to the body; i.e. it's low impact. It's also called a elliptic trainer, and the French call it a vélo éliptique; an elliptic bike. I call it an angry trainer just to be awkward. 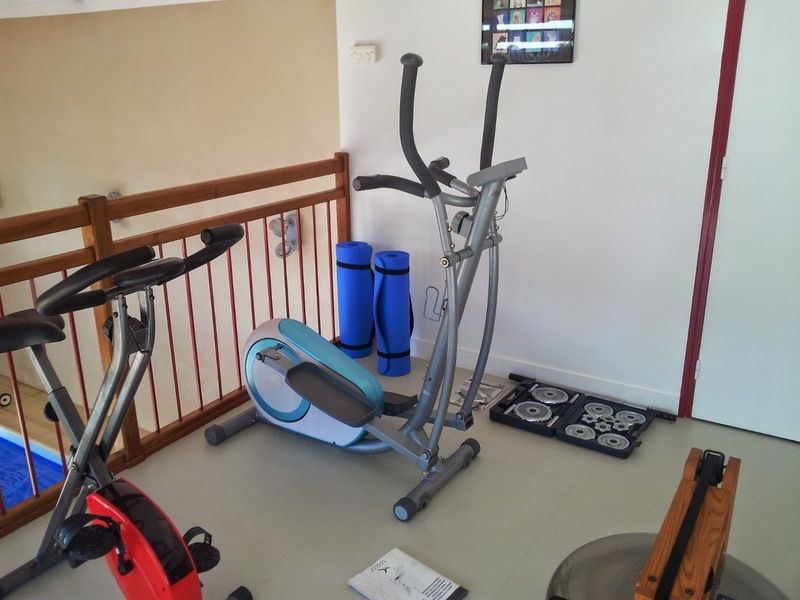 Our little gym in the gîte features a stepper, a rowing machine, an excercise bike and a treadmill, but up until now, no cross-trainer. Since I'm on a fitness kick at the moment (part of managing diabetes) I have been on the lookout for one, to add a bit of variety to my indoor training. Well I found one at the car boot last weekend. Domyos brand, a good name for gym kit, not a current model but only a couple of years old and according to the one careful lady owner, scarcely used. 50 euros, say 45 quid. I bought it. Looks like a bargain. If it falls to bits in a fortnight I'll let you know. It's not for heavy use, (recommended 45 minutes/day average) and I won't come close to that. I was a bit worried that, since it is intended for relatively light use, the resistance available would be inadequate; I wouldn't be able to work out hard enough. Well, after 45 minutes on the lightest setting, I'm pleased to note that this is not the case. But it told me I'd used up over 500 calories. If my treadmill ever told me I'd used that much, I think I would have killed myself; just 150 calories on that and I'm knackered. They can't both be right.